The Service Dog Do Not Distract Jacket easily slips over the dog's head or opens in the front and straps around the girth of the dog. The chest and girth are both wide straps so the jacket does not flop around on the dog. The girth strap is adjustable and has a side release buckle. The front chest strap is also adjustable and has a wide Hook and Loop closing. There are no rings, buckles, or pockets on this jacket as I did not want to disturb the dog while working. The entire jacket is bound with reflective binding for evening and early morning safety. It is also lined to give it stability. The Service Dog Do Not Distract Jacket comes in 5 sizes and will fit nearly any dog. This is a great feature for those who are training all ages and sizes of dogs. 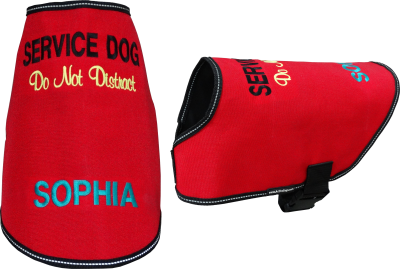 The Service Dog Do Not Distract Jacket comes embroidered FREE, but all patches are optional and may be purchased additionally. If you have any trainer, organization, or club patches; at no extra charge; just send them to us, let us know they are coming and that they are to be added to the Service Dog Do Not Distract Jacket. 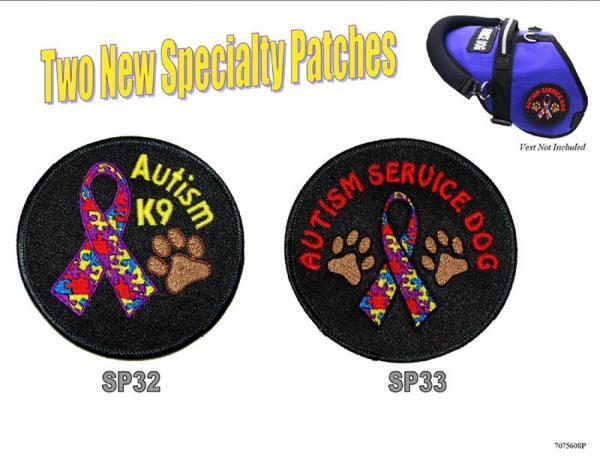 We would be happy to sew them on for you at no extra charge, just send them to us and let us know they are coming to be added to the Service Dog Do Not Distract Jacket. Check out our Patch Selection!